Z57 Internet Solutions has created a curriculum designed to teach you real estate professionals – even those whose business is struggling - to wildly successful. Our ZPro certification, available to graduates of our revolutionary Z57 Academy, along with our internet marketing tools and strategies, will provide you with all the tools you need to succeed. 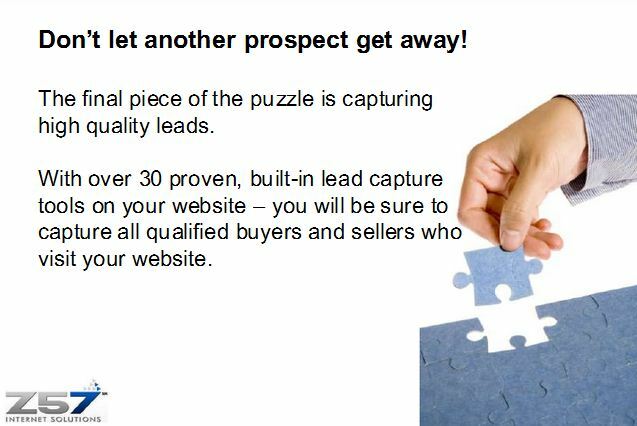 Lead generation doesn’t happen by itself. It requires planning, dedication, strategy and commitment. Z57 Internet Solutions will teach you how to enhance your marketing and generate success by helping you build an impactful brand strategy. We’ll focus on how to maximize your budget and your time by taking full advantage of all the free and built-in tools available to you. Z57 internet Solutions will help you build a rock-solid prospecting base that incorporates both online and offline marketing. If you’ve been prospecting for a while, you’ve probably heard of the 5 Business Card Challenge. Just in case you haven’t – this is how it works. Put 5 business cards in your pocket when you get ready to start your day. Go out of your way to talk real estate and exchange cards with at least 5 people you’ve never met before over the course of your day. Don’t go to bed until you’ve handed out all 5 business cards to new contacts. This simple strategy alone can create 5 new contacts each day. That’s 35 new people per week, 35 people per week – 1,820 new people per year - with one simple strategy. How do you create a business card that will maximize your success level with this strategy? We can teach you! With years of experience working with real estate professionals, we know that the true success of any prospecting campaign is completely reliant on follow-up. Not only do you need a lead management system that makes it easy for you to follow-up with clients, but you need to be able to provide them with products and services not available from other Realtors. Z57 Internet Solutions can offer you all of that and more – from a lead-capture enhanced website to automatic marketing campaigns – you can’t go wrong! Contact Z57 today to learn how we can make you and your business wildly successful.